Tai Chi Chuan is a unique, centuries-old Chinese exercise that integrates into one system elements for health improvement, a moving meditation and a martial art. Based on a sequence of 108 slow naturally flowing movements, the Tai Chi set is ideal for all ages and abilities. It is designed to relax the body and mind, to improve concentration, and to develop flexibility and strength. The gradual stretching and slow turning motions involved in the movements results in: a loosening of the joints and tendons; facilitates natural movement in the spine by relaxing points of tension in the body; and allows the free circulation of the internal energies (jing, chi and shen). Tai chi can assist in the integration of the mind and body, leading toward harmony between ourselves and the universe. Tai Chi is often translated as the “supreme ultimate”. Tai Chi Chuan is the practical exercise which in part, aims at the restoration of one’s original nature in harmony with the “supreme ultimate”. Tai Chi Chuan was developed in China by the Taoist monks who incorporated their knowledge of meditative practices into a series of postures based on the instinctive movement patterns of animals. Chang San-feng, a Taoist sage of the Sung Dynasty (11th century), is recognized as the originator of Tai Chi as a formal system of exercise. Mr. Moy incorporated the temple traditions into the traditional 108 Yang long form set with a focus on well-being and longevity. The set Mr. Moy developed embodies the culmination of thousands of years of research by Taoists, Buddhist and Confucian scholars into a system for complete physical, mental and spiritual health. Mr. Moy adapted the traditional Yang set by adding more turning and stretching to open the student’s joints and massage the internal organs. Mr. Moy also borrowed from related internal martial arts (Lok Hup Ba Fa, Hsing-I and Pa Qua) and added elements of Taoist and Buddhist chi kung practices to enhance the health benefits of the Tai Chi set. The Canadian Tai Chi Academy (CTCA) was founded by senior students of the late Moy Lin-shin (1931-1998). The Academy’s sole purpose is to enable others to learn the arts as taught by Mr. Moy and to enjoy the health benefits through continuous practice and life-long learning in a friendly, non-competitive environment. In July 2007, the Canadian Tai Chi Academy was approved as a registered charity based in Toronto, Canada dedicated to the teaching of Chinese internal arts for health as passed on to us by Mr. Moy. The mission of the Canadian Tai Chi Academy is to help people of all ages to maintain or regain good health. The methods we use are through the practice and teaching of Tai Chi and other internal arts passed to us by Mr. Moy Lin-shin and from the generations of Chinese Internal Arts Masters who passed this knowledge to him. To support all students of Master Moy’s Tai Chi and other internal arts in developing new CTCA locations, through advisory, financial, instructional assistance and workshops when requested. The academy is a non-profit charitable organization. Neither the directors, officers, nor the instructors are paid for their services. All dues and donations go toward supporting, maintenance and expansion of the organization, and preserving the quality of instruction. The volunteer aspect of the Academy provides many opportunities for members to contribute their time and talents for the benefit of others, and often to learn new and valuable skills in the process. Members of the Academy contribute many hours of service in their communities. This includes working and fund raising for many different charitable organizations such as: the Parkinson Foundation, the Multiple Sclerosis Society of Canada, local food banks and other worthy organizations. Master Moy was a Taoist monk who studied Tai Chi, Chi Kung, Lok Hup Ba Fa, Hsing-I and Pa Qua in the monasteries in China (Three Teachings Temple) and from various teachers in Hong Kong. After emigrating to Canada in 1970, he began teaching internal martial arts in a small studio in Toronto and regularly travelled to Montreal to teach students. When he found that his students needed to regain their health more than they needed to learn how to fight, he changed his teaching to better serve that need. He modified the Yang Style Tai Chi 108-move set to emphasize turning, stretching, rising and falling, expanding and contracting, borrowing principles from the internal martial arts and chi kung. In addition, he taught supplemental exercises not generally associated with tai chi. Mr. Moy was always attentive to the needs of each student. He would change his methods to suit the students’ needs, paying close attention to students with health problems. The instructors at the Academy aim to follow his example, helping each student follow his or her best path to the common goal of health improvement. As a child, Master Moy was afflicted with serious health problems. His family took him to the local monastery for help. He recovered his health through the practice of Taoist internal arts. As a result, Mr. Moy understood the great potential to improve health and alleviate suffering by the practice of these disciplines. He vowed to make the Taoist internal arts available to all who wish to learn them. 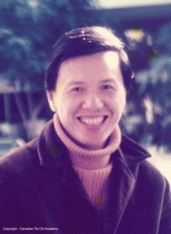 Master Moy passed away in Toronto (June 1998). The Academy’s mission is to continue Mr. Moy’s legacy. Mr. Moy said that he had six teachers in his life. Only the last two were influential. They were Mr. Liang Tzu-pang his Tai Chi and Lok Hup teacher and Mr. Yeung his Chi Kung teacher. His deep understanding of the Taoist Arts has been brought to the public the wisdom of the ancient Taoist sages. Mr. Moy’s vision and goal was to provide the tools and opportunities for people to regain their health. Mr. Moy’s motivation was to do the work of the Bodhisattva to relieve the suffering of people.